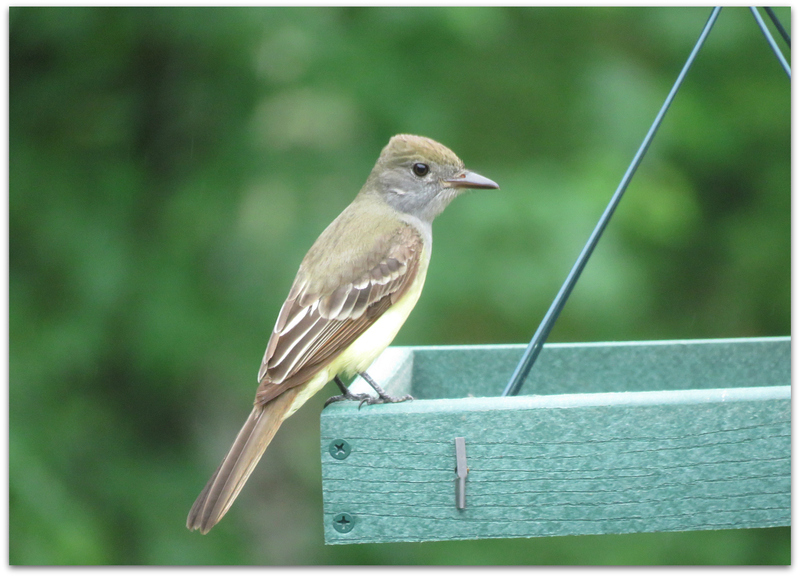 Great Crested Flycatcher visited the platform feeder shortly after I put out some homemade suet dough with blueberries yesterday around noon, in rain. 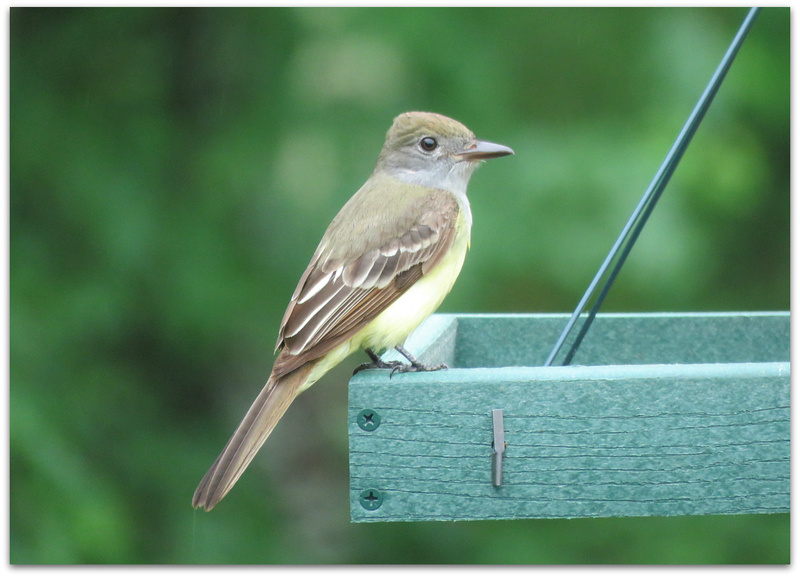 A large, assertive flycatcher with rich reddish-brown accents and a lemon-yellow belly, the Great Crested Flycatcher is a common bird of Eastern woodlands. Its habit of hunting high in the canopy means it’s not particularly conspicuous—until you learn its very distinctive call, an emphatic rising whistle. These flycatchers swoop after flying insects and may crash into foliage in pursuit of leaf-crawling prey. Great Crested Flycatchers are large flycatchers with fairly long and lean proportions. 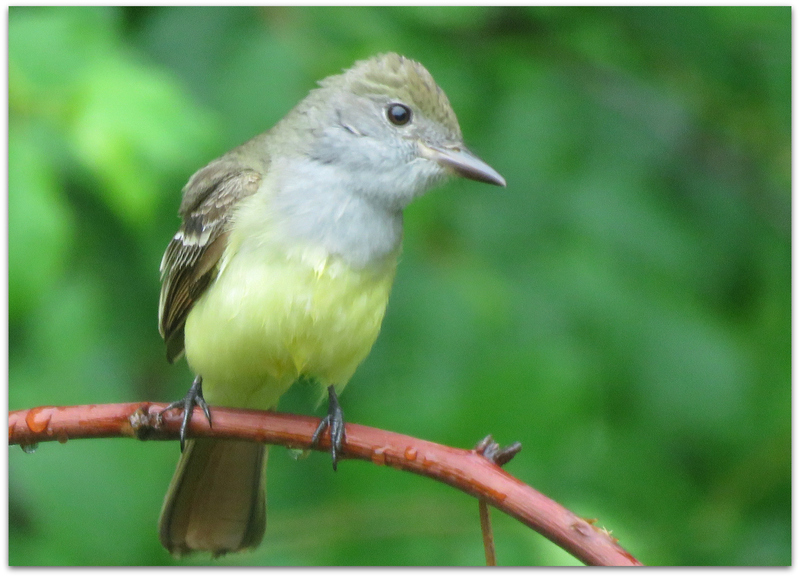 Like many flycatchers they have a powerful build with broad shoulders and a large head. Despite its name, this bird’s crest is not especially prominent. The bill is fairly wide at the base and straight; the tail is fairly long. 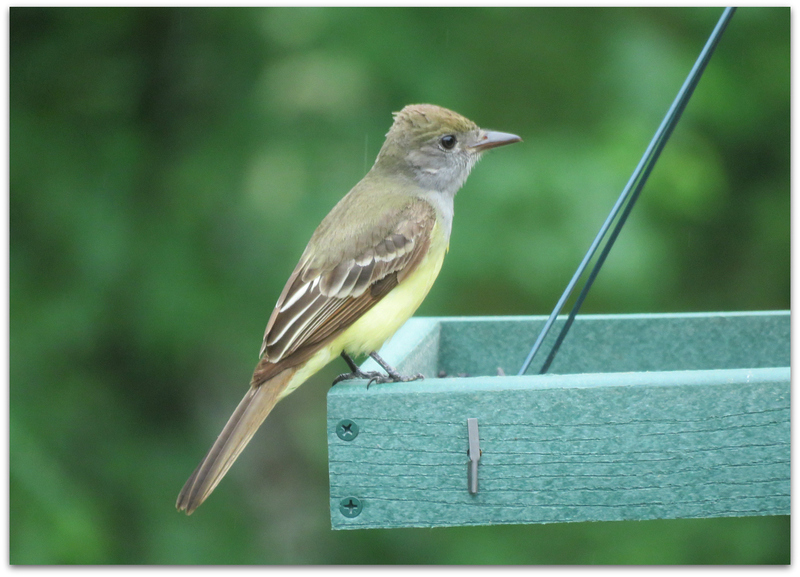 This is the first time I have ever seen one of these flycatchers in my backyard… or anywhere. It posed in a few locations visible through the kitchen window. 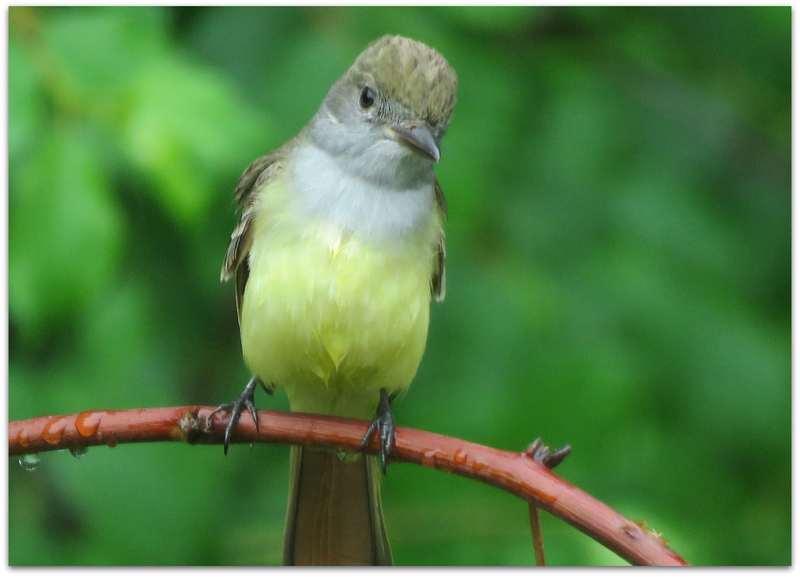 Great Crested Flycatchers are sit-and-wait predators, sallying from high perches (usually near the tops of trees) after large insects, returning to the same or a nearby perch. They winter in central and southern Florida, southern Mexico, Central America, and northwestern South America. And summer in the lovely New Hampshire Seacoast, among other places. 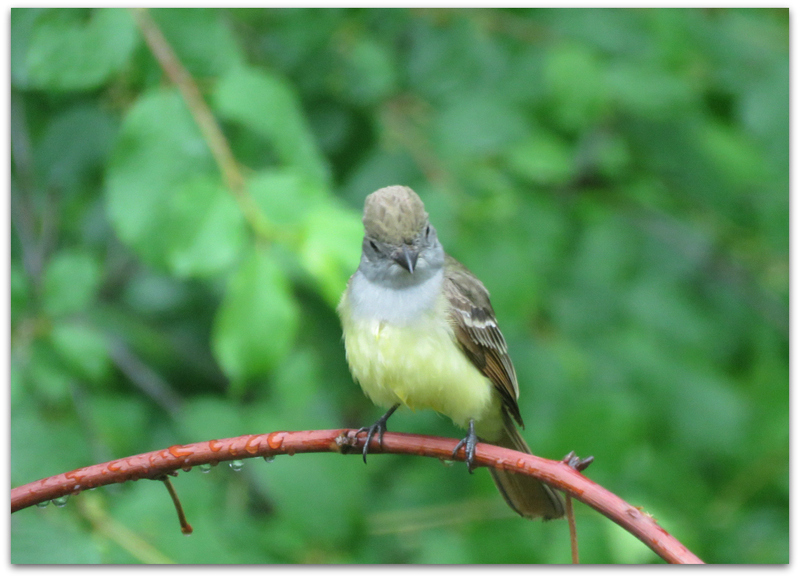 Great Crested Flycatchers prefer breeding territories in open broadleaf or mixed woodlands and at the edges of clearings rather than in dense forests. They avoid the northern coniferous (boreal) forests of Canada. Among woodlands, they favor edge habitats in second-growth forests, wooded hedgerows, isolated woody patches, and selectively cut forests over continuous, closed-canopy forests. Dead snags and dying trees are important sources of the cavities they need for nesting. They tolerate human presence and will search out cavities in old orchards and in woody urban areas like parks, cemeteries, and golf courses. 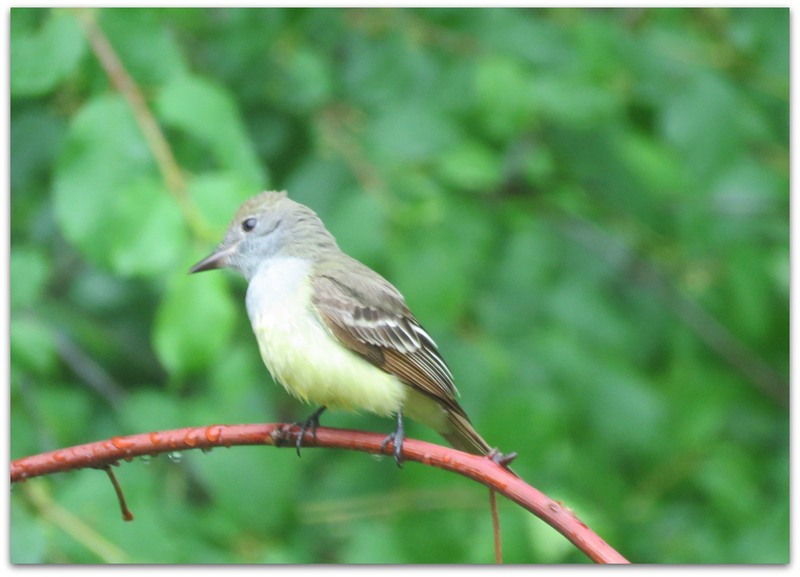 Great Crested Flycatchers eat mainly insects and other invertebrates, as well as small berries and other fruits. They eat butterflies and moths, beetles, grasshoppers and crickets, bugs, bees and wasps, flies, other insects, and spiders. These they’ll take from the air, the surfaces of leaves and branches, off the ground, from haystacks, from bark crevices, or from crannies in such human-made structures as fence posts and rails. Plant food includes small whole berries, the pits of which are regurgitated after the berries are eaten whole. It’s a pretty bird, with a lemon-yellow belly. 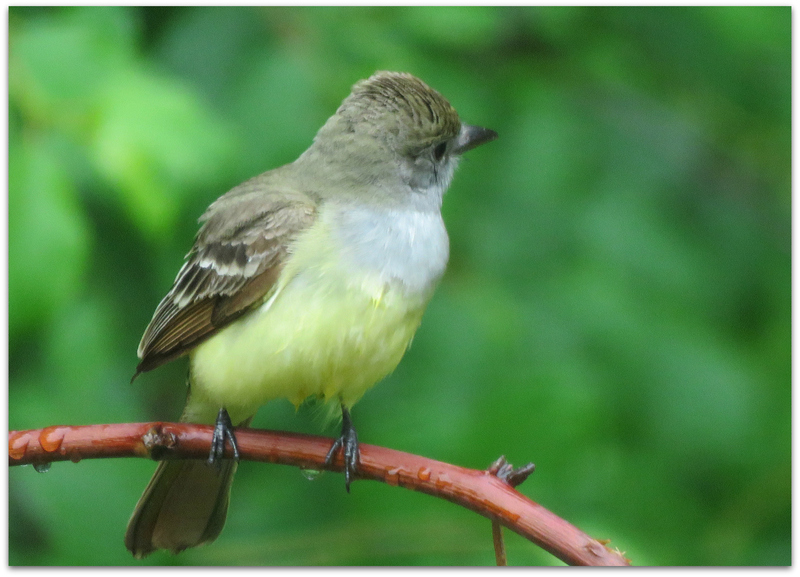 This is the 40th backyard bird I have seen, photographed and blogged about since I started this bird blog in May 2014. 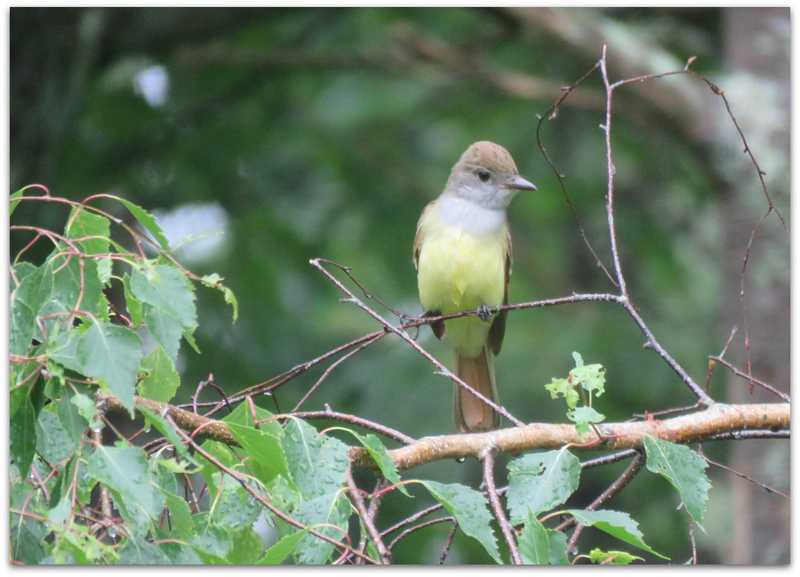 This entry was posted in Uncategorized and tagged birds, Great Crested Flycatcher on June 16, 2015 by Amy.